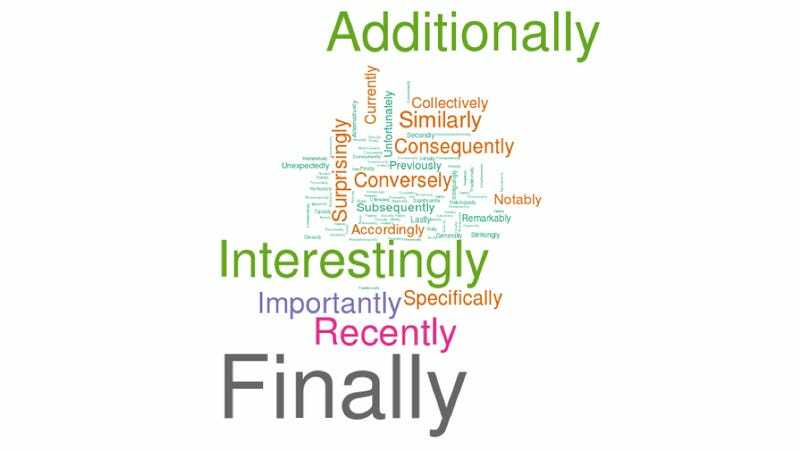 Collectively, scientists love adverbs. Here are the ones they love most. Recently, statistical bioinformatician Neil Saunders decided to look for sentence adverbs in close to 100,000 scientific abstracts. (You know sentence adverbs: "Remarkably, the guinea pigs were wearing armor they had fashioned themselves. Unfortunately, it seems humanity's days are numbered.") This is what he found. It seems that the most popular use of the sentence adverb is to draw a close to the proceedings, with finally. The next most common uses: to indicate further points of interest (additionally), label results as interesting (interestingly) or important (importantly) and show that the authors are up to date with their reading (recently). "Findings are frequently surprising," he writes, "but more often unfortunate than remarkable."